Need some help possibly. I just bought a DVL-909. It powers up, ejects the tray and seems to work great until I press play on a laserdisc. As soon as I press play, the display says OPEN and ejects the disc. I just got a fresh VEB1184 belt and put it in hoping that was the issue but the problem remains. I tried a DVD as well, but the player makes a grinding noise for about 4 seconds, then ejects the DVD as well. I have a small update. I was noticing that when I try to play a laserdisc, no noise is made by the player. However, when I try to play a DVD, it sounds like gears are trying to turn, but stop after a few seconds. I popped open the tray and took a picture of a lower gear that looks like it helps to lift a lower part of the assembly. Some of the teeth on the gear don't look quite right. Can anybody share their opinion on this gear and if it looks right/wrong? That is how the gear is supposed to look, however the missing tooth area should lined up more with the large black gear. The little white gear controls the tilting of the mechanical assembly for playback alignment. If it engages too early during a load process it will cause issues by hitting it’s stop which will also stop the large gear. But your problem could be other issues too like the turn mechanism gear in the back. 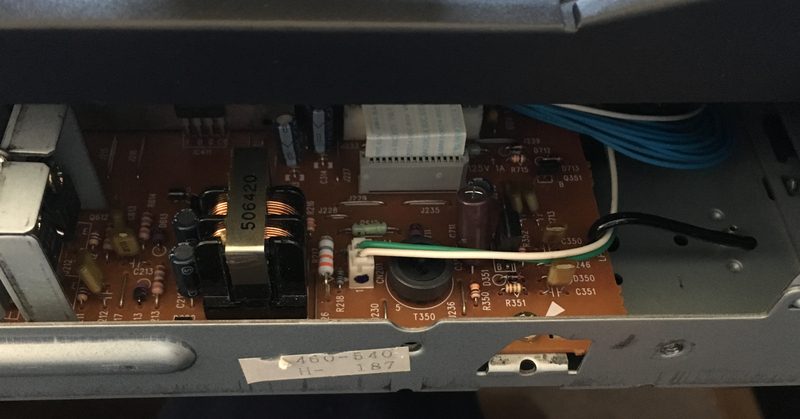 With the bonnet off, when you switch between LD and DVD (can be done by just pressing the DVD eject vs LD eject), do the pickups,swap out the LD pickup for the DVD pickup (and vice versa)? There is typically a "gear grinding" noise when loading a DVD for the tilt adjustment (pickup actually moves closer in to the surface of the disc). Ok, I took the top off, tray out and took a video. It seems like the white gear is working with the black gear. I wonder if the assembly is not getting high enough for the disc to start spinning and be read. To blam1, it does switch h between ld and dvd lasers successfully. There is no grinding noise when the lasers are changing positions. I hope the video helps shows an issue. Kurtis, is there a way to retrain the gear to rest at a different spot? The gear is operating in the correct position in the video. The picture you posted does not look right. Watching the video, the first action is a normal eject sequence. The when you manually initiate the load cycle everything looks fine. Have you tried pushing the play button on the remote or the unit. If the remote works but the front does not then you have an issue with the front board. Now this is said if the rest of the unit is working correctly. As mentioned above, when you power on the unit and press the DVD button the laser should turn over as laser in the video looks like the LD laser from viewing the cable. 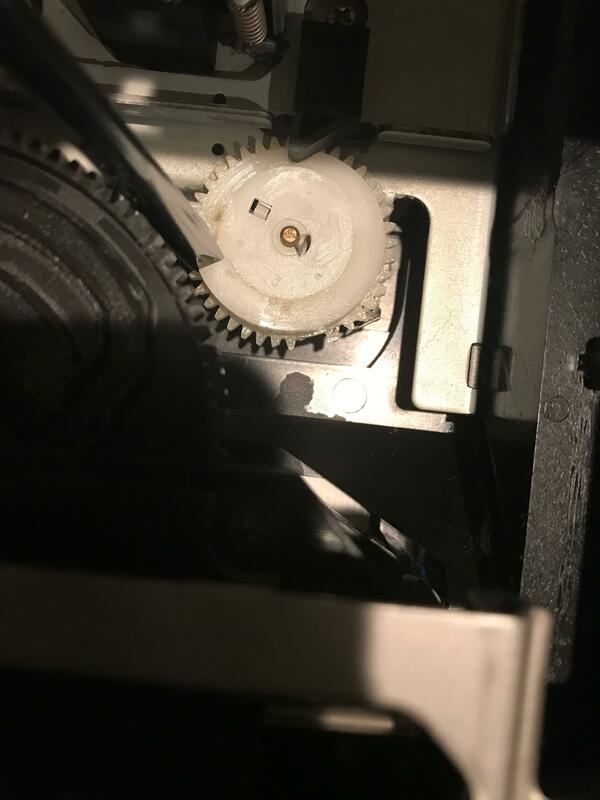 If the LD laser does not go into the turn mechanism and it turns over and extends the DVD laser then you have to work your turn mechanism problems. Then maybe everything else will work fine. If it doesn't work post a video of the laser and turn mechanism movements. This looks normal to me. Please put the clamp back in place and then load a DVD or CD, taking a video from the left side of the player so we can see the movement of the laser pickup. I have an updated video. This shows startup of the player. Later, I’ll get a video showing the left side of the player. I tried using the remote last night, but issues remained the same. The unit responded exactly the same as when I pushed buttons on the front panel. You all are so appreciated! Thank you for helping me this far. https://youtu.be/Yu6dww3CgDQ - Side operation. Loading a disc and pressing play. Used a CAV disc here. Gathering it doesn’t play a CD or DVD? Mechanically everything looks fine. You are now looking at an electrical issue. Neither CD or DVD requires the LD video circuitry to operate so checking those is a good test. On the left side of the player is the power supply. There should be a connector with two wires (green and white) coming off the end of the board which disappears under the player mechanism. It is about an inch back from the front edge of the board. This is the connector for the spindle motor. Yours is acting like it isn't connected, or perhaps the motor is burned out. If it is burned out, the motor from any DVL or DVK player will work as a replacement. I think we have a Eureka! moment. At blam1's advice, I turned off power to the DVL-909, removed the power lead for the spindle motor, and started the player up. It went through the normal startup cycle. I loaded an ld into the player, waited for it to be recognized and hit Play. It said Play on the display for a second or two, and then said Open, just like when the spindle motor was plugged in. Curious about this, I went over to my completely working DVL-700. I opened it up, disconnected the spindle motor power lead, then started the player. It started fine just like the 909. I loaded a disc, waited for it to recognized and pressed Play. It showed the same symptoms...displayed Play for a second or two, then said Open and eventually popped the tray open. So, it seems like the player is trying to initiate the spindle motor, failing, then kicking out the disc. Anybody got a spare spindle motor or can someone point me to working part numbers? I'll take care of the rest. Glad to hear it sounds like you've gotten to the bottom of this. PacParts lists VXX2579 as the spindle motor for the DVL-919. Save your old motor. I heard there was someone in the process of trying to rebuild them. May or may not pan out, but worth keeping it around just incase. At the very least, you can pull the turntable (with the white ring) off and put it on another DVL motor that still uses the black rubber ring. Just wanted to let everyone know I was able to replace the spindle motor last night. Everything went smooth and it took about an hour. I had a couple hiccups with putting everything back together, but it played a disc! I'm very excited to have fixed it and can't thank all of you enough! The total repair was a bit over an hour.